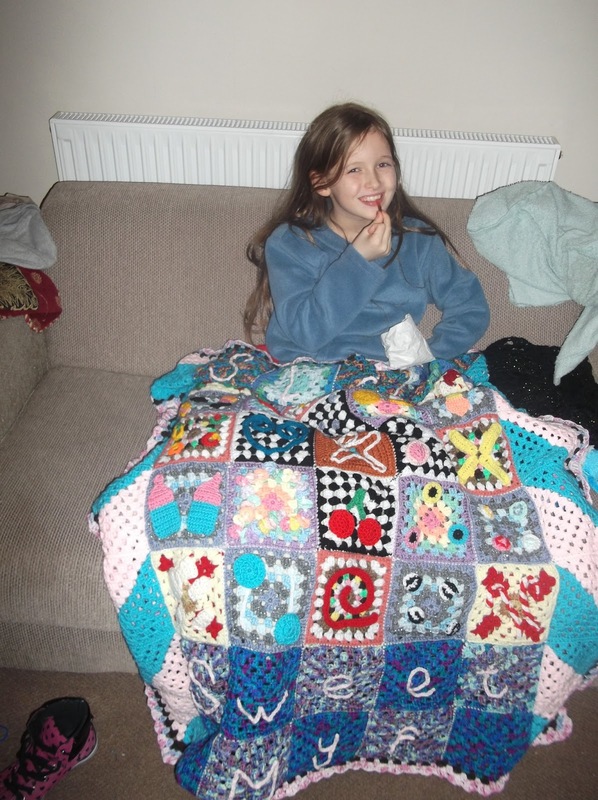 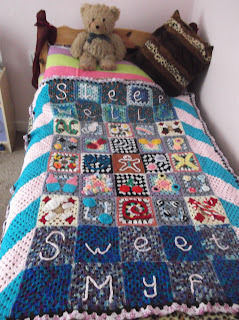 So in my last post, I showed you the lovely 'Sweet Dreams' blanket Myf and I worked on for our sweetshop friend. 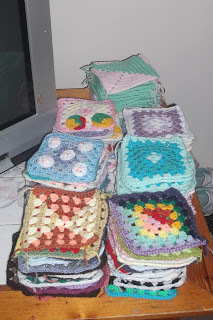 I mentioned that Myf really wanted a little one too so I set her up with my camera and she took a load of photos of the squares she liked before I started putting them together. She also sat for an hour making a long list of the squares on paper so that there was an extra record for me. The top photo are the squares Myf wanted as the 'background' squares. 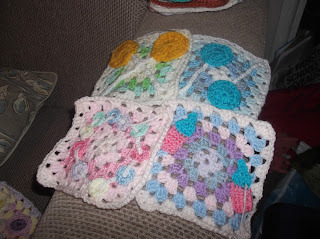 From Wednesday until she got back on Sunday, I worked like a demon! 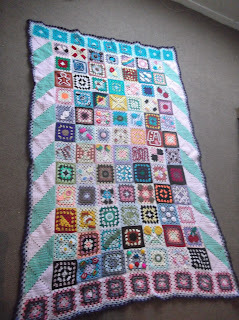 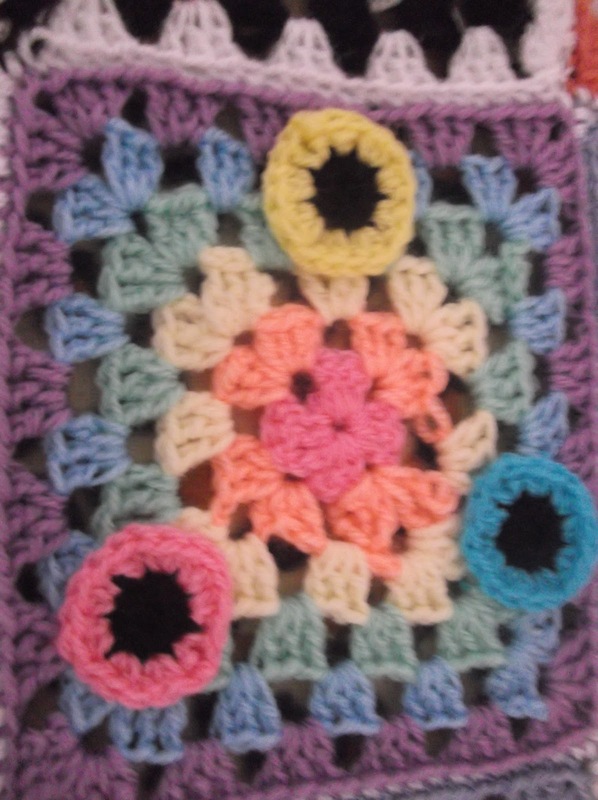 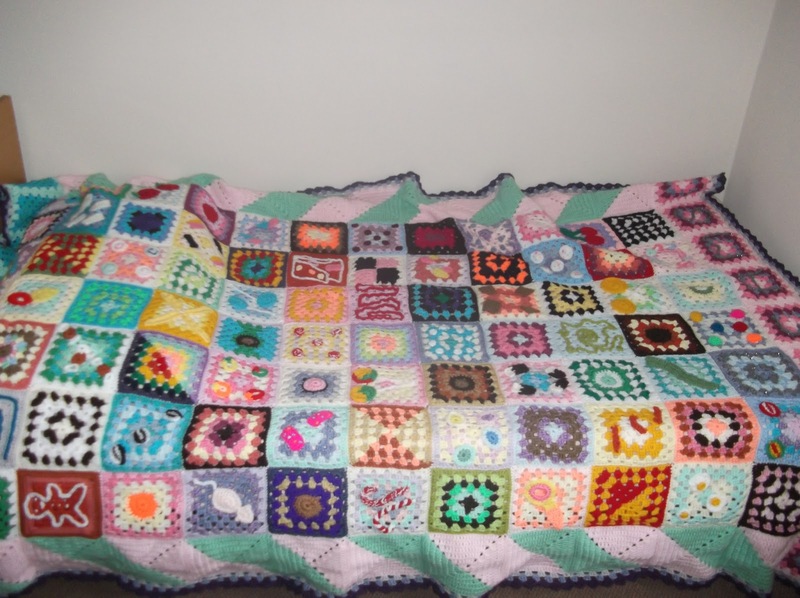 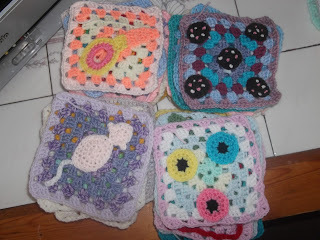 I added about 38 squares (it's a little shorter than I would use for an adult single blanket, 9 by 7) with a border. 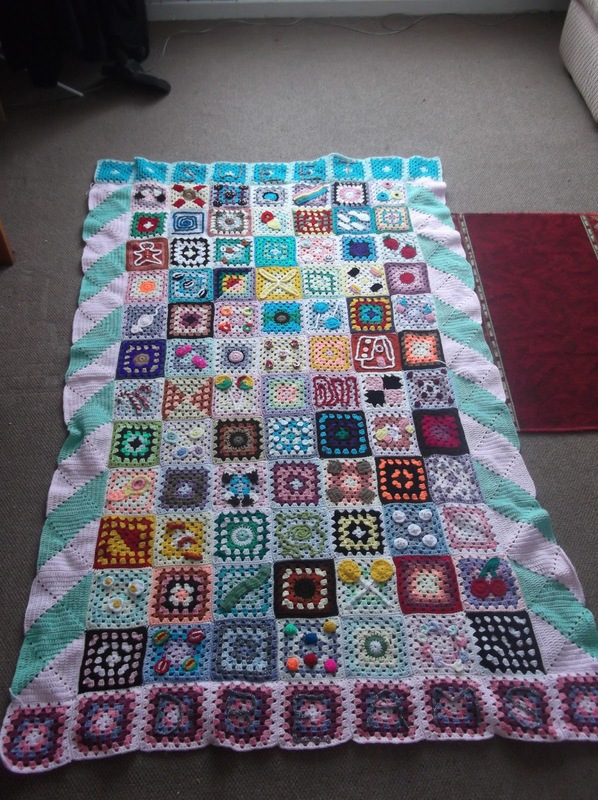 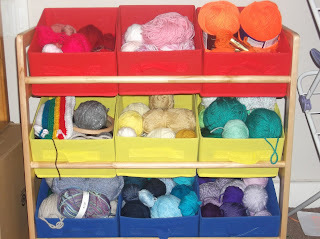 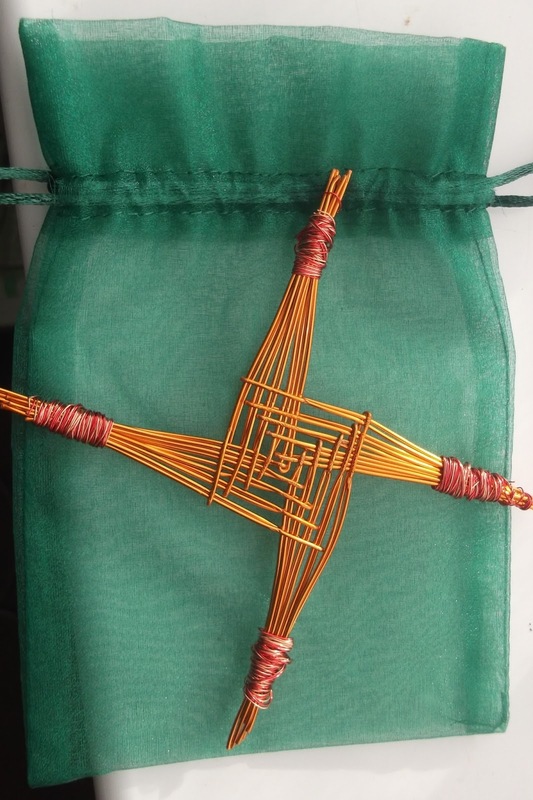 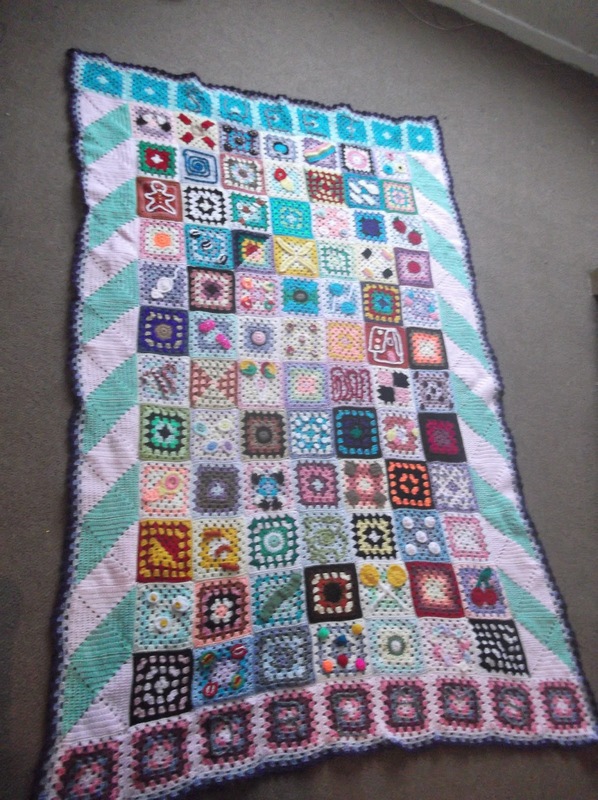 Myf was due home at 4.15pm- I finished the border, wove in the loose ends, ran upstairs to put it on her bed, sat back down and she knocked on the door! 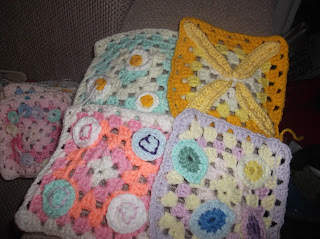 I have never crocheted so fast on the border-my hands were shaking so hard for about an hour afterwards. 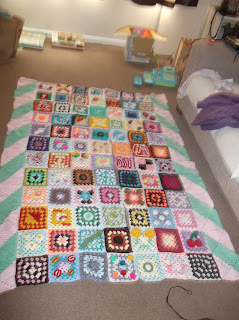 I was praying to the Goddess over and over that I could finish it in time- talk about a close race! 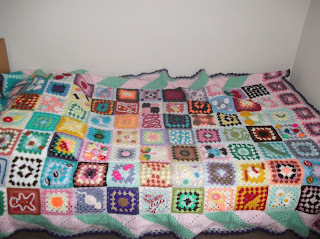 There is a very special square in this blanket. 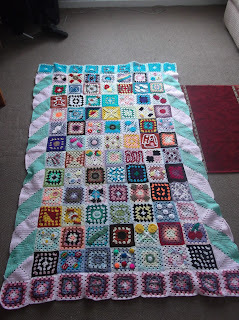 See if you can spot why! Look closely at the orange round. 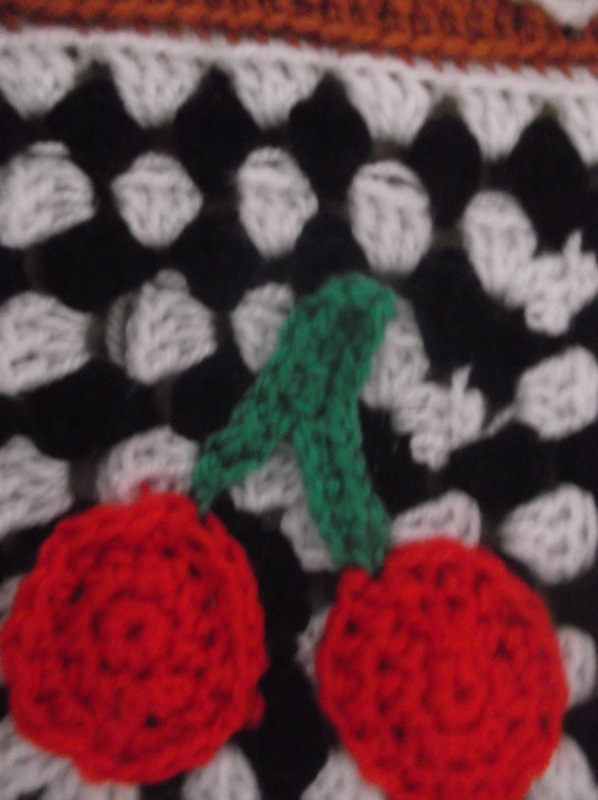 See how it's a little uneven? 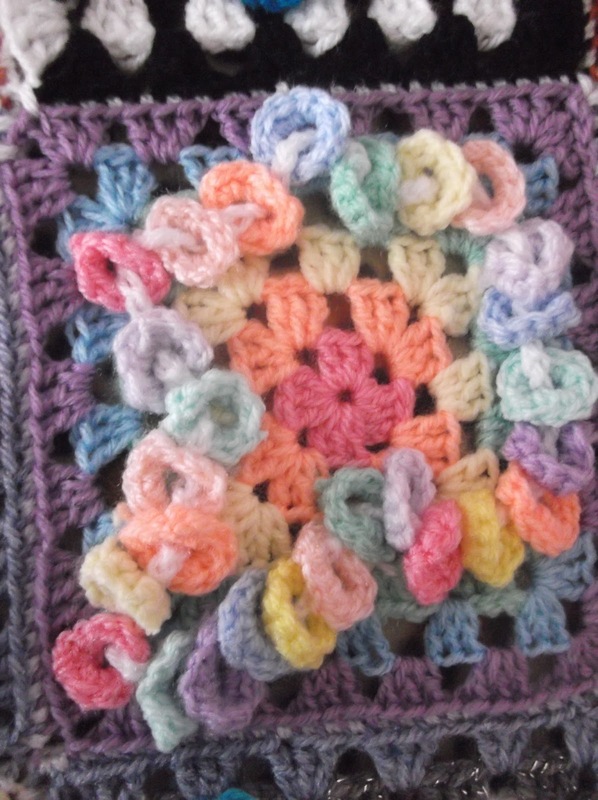 This is Myf's FIRST try at double crochet-and her very first bit of a granny square! The bottom one is a candy necklace-you can see the original one from the 'Sweet Dreams' blanket in the 6th photo down. 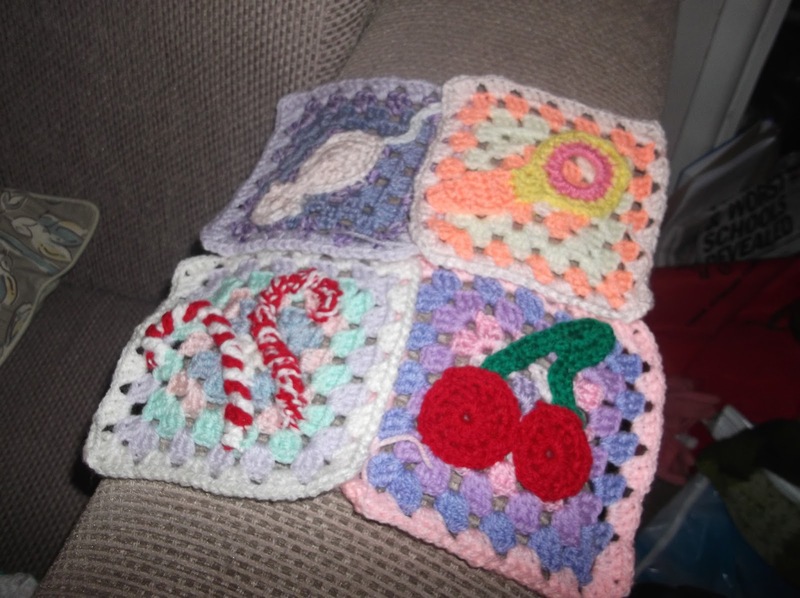 For Myf's I really tried to fill it with 'sweets' and I think it looks great, despite the THREE hours it took to make! 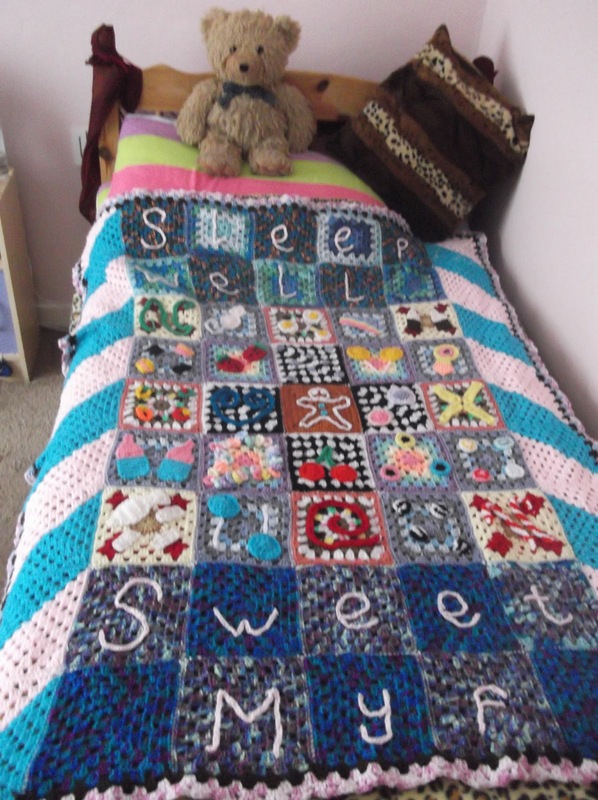 The top panel has 'SWEET' written across it in silver/grey chain stitch and the bottom of course says 'DREAMS'. 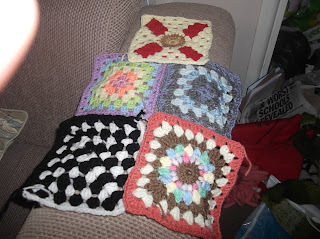 I pondered the border for ages. 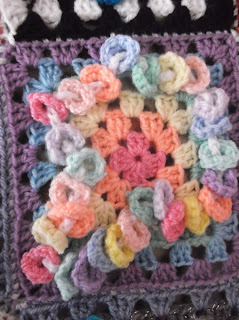 I was originally planning to use a variegated yarn that came in free with another shade I wanted and has been hanging around waiting-it has hues of blues, purples and greens that I thought would work well with the pinks and greens on the outer edge of the blanket. 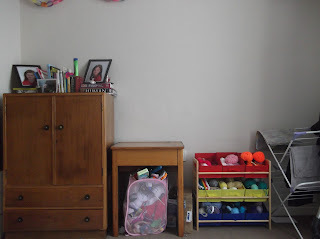 Myf wasn't too sure and once I had it laid out, I could see what she meant! So I started with a very pale lilac and moved to a 'parma violet' shade and finished with a dark, almost plum, shade for the last round, putting 2dc, ch2, 2dc into each space and 2dc, ch2, 2dc, ch3, 2dc, ch2, 2dc into the corners and making a pretty zig-zag effect :-) I still haven't found where that pattern comes from, I'm SURE it's from Attic24 somewhere but I can't find it! The 'Sweet Dreams' Blanket is very nearly finished: I'm putting the last round of the border on it now, it looks so beautiful and we may be able to actually give it to our friend tomorrow! 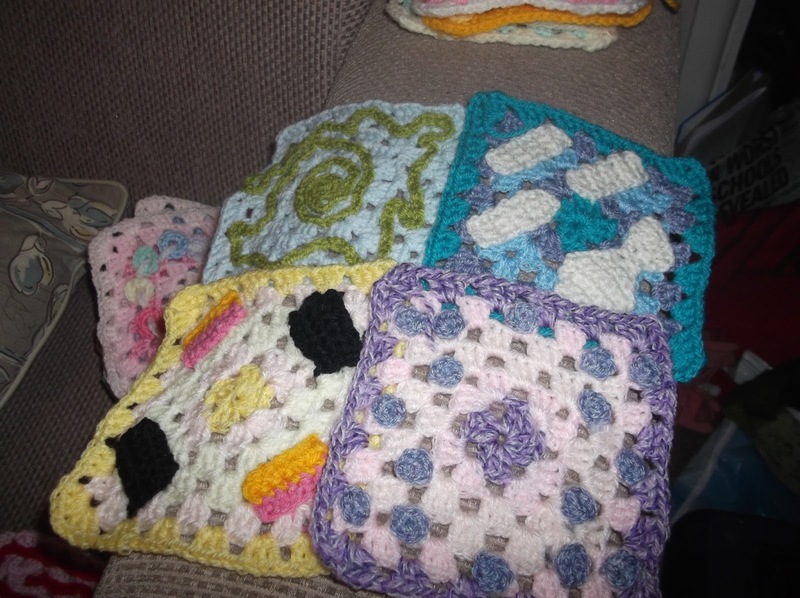 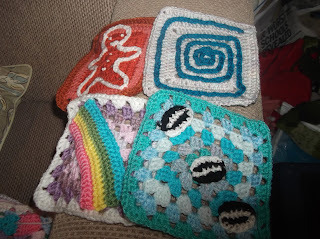 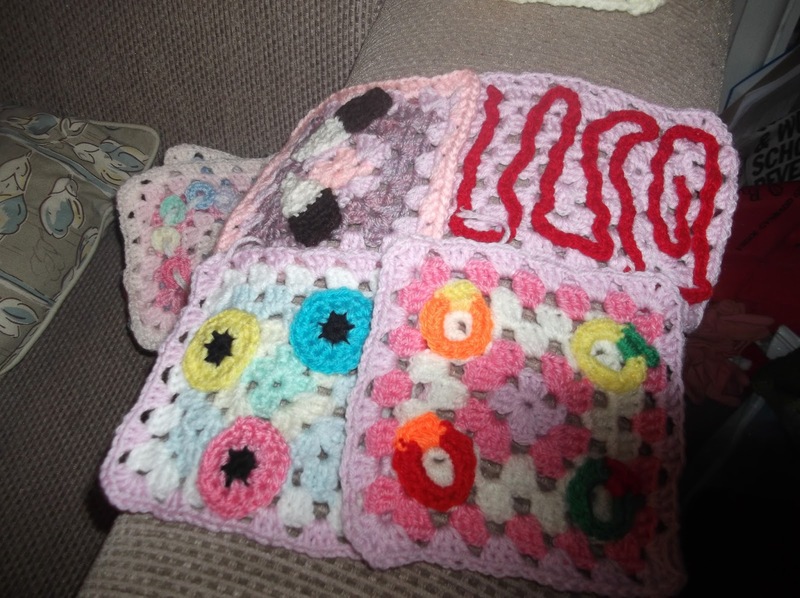 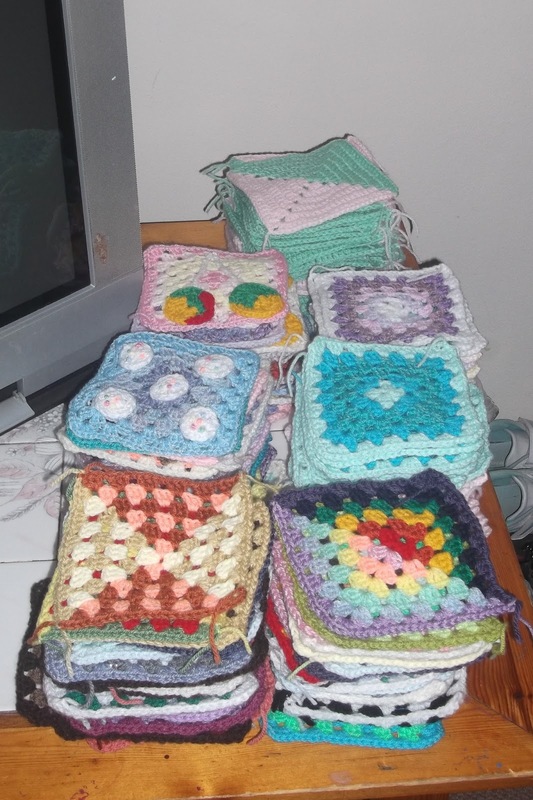 Myf has had so much fun suggesting sweetie ideas and as she wants a little lap blanket with this theme so I let her use the camera to pick out the sweet squares she wanted in hers. She also spent time writing a list as well so very soon I can start making hers! 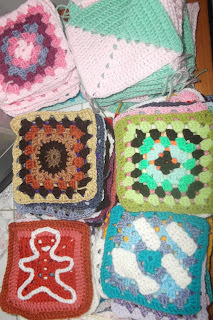 I've only got a handful of squares left to make for the 'Sweet Dreams' blanket-I'm no good at putting them together as I go, I enjoy laying them out and changing the order around too much! 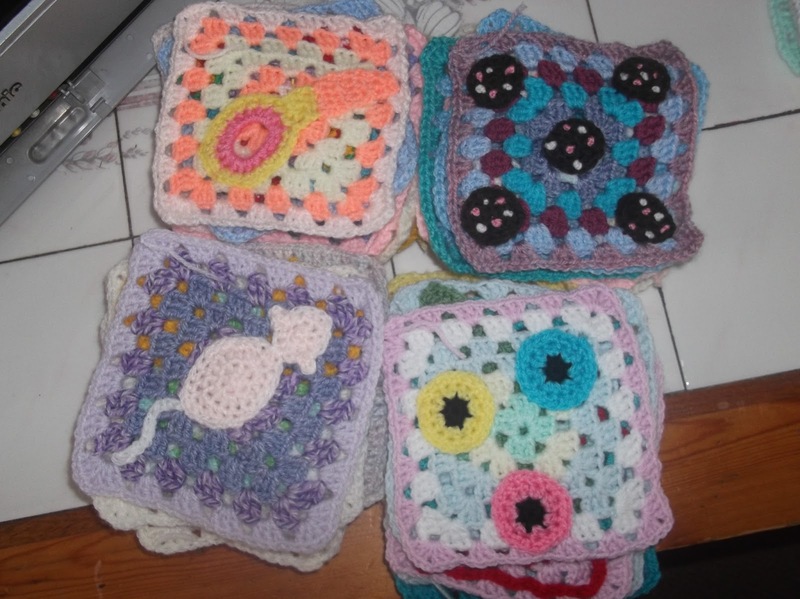 I wanted to showcase a couple of special squares here. Myf has been collaborating with me on the sweetie squares and one of her suggestions was to make a 'gingerbread man' square. 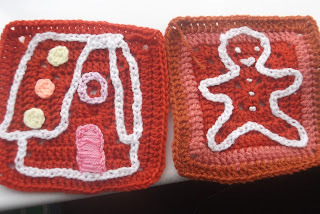 I said I wasn't sure if I could crochet something like that-and she suggested making a ginger-coloured square and using white chain stitching to describe the gingerbread man! Isn't that clever? So I made it and it came out really well so I took it further and made a gingerbread house sqaure as well :-) Here they are!